Three members of the Chaminade ‘ohana were honored at a special mass on January 23, 2019 as part of the annual Heritage Awards. Each year, Chaminade University recognizes three individuals who exemplify the Marianist tradition on campus and live and share Marianist ideals. This year’s award winners were Sister Malia Wong, O.P, Riu Jiang Huang and Savannah Delos Santos. The Chaminade Award is given each year to a faculty or staff member who exhibits a continuous commitment to Marianist values. 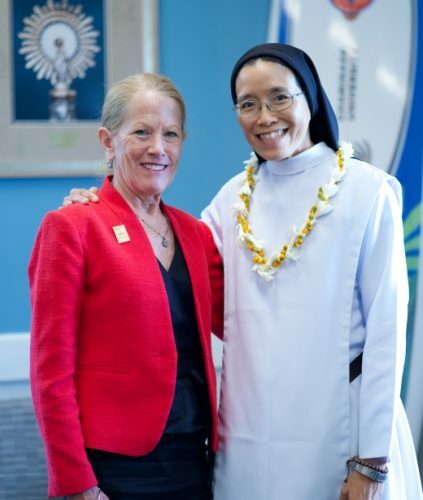 This year’s recipient, Sr. Malia Wong, is a Chaminade alumna and has been a senior lecturer in religious studies at Chaminade University for over 18 years. In addition to teaching classes, Sr. Malia also creates an All Things Marianist video series, documents plants and trees on campus and their natural medicinal properties and makes regular visits to individuals in the hospital—to name just a few. 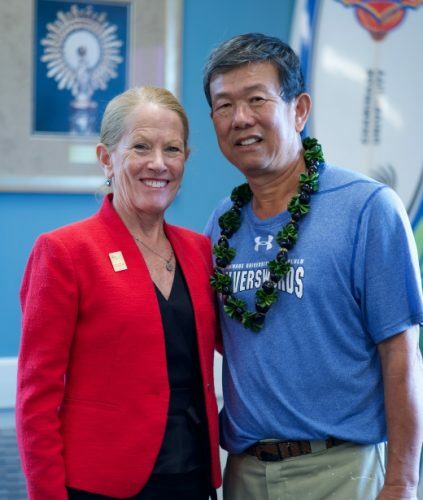 Riu Jiang Huang, this year’s recipient of the Marianist Award, has been an electrician at Chaminade for over 20 years. There is no obstacle too big for Riu. He constantly finds creative solutions to problems, approaches every individual with a smile and communicates the spirit of faith, service and commitment in all that he does. Riu is known for his ability to bring laughter and joy and expressing his kindness through actions. 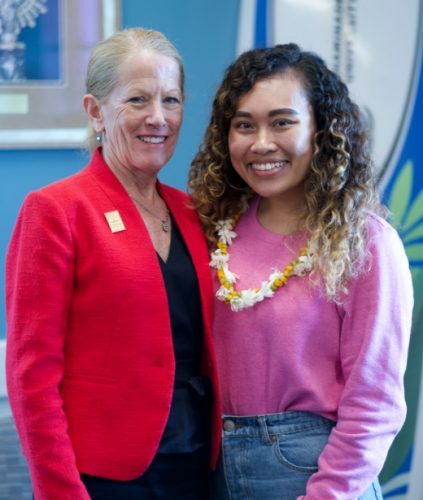 The Founder’s Award is presented each year to a student who has exhibited a spirit of faith, demonstrated a commitment to Marianist values and served as a role model for the Chaminade community. Savannah Delos Santos was the well-deserved recipient this year. She is an active participant in Campus Ministry, was a member of the university’s strategic planning task force, is a participant in the Hogan Entrepreneurial Program, interned for a fashion designer and helped plan a national conference. Her enthusiastic willingness to embrace every opportunity that is presented to her indicates both her faith and her response to God’s call. Congratulations and mahalo to our three award-winners! We are blessed and honored to have your unique gifts as part of our campus community.